oftwominds-Charles Hugh Smith: The Superhero Complex: Are We Incapable of Saving Ourselves? If we felt empowered in daily life, would we be so enamored of superheroes constantly saving our world from destruction? It's been widely noted that the U.S. film industry ably functions as a pro-global hegemony propaganda machine: even when the plot features evil rogue elements at work in a global-hegemony agency (Pentagon, CIA, NSA, etc. ), the competence of the agency is never in doubt, nor is the agency's ability to rid itself of the evil rogue element. Evil conspiracies are revealed and the Good Guys/Gals win. This depiction of official competence and the moral righteousness of patriotic employees is not surprising; these agencies have long "cooperated" with Hollywood on many levels. More troubling is the recent film-industry depiction of our dependence on superheroes and their superpowers to set things right. 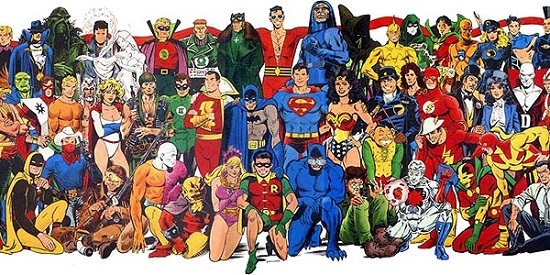 The benign view is that Hollywood is always seeking new billion-dollar source materials for multi-film franchises, and comic book heroes are tailor-made for franchises: not only can multiple films be made about individual superheroes, but the potential for mix-and-match combinations of superheroes is practically endless. The less benign view is that the popularity of superhero movies reflects a deep insecurity and worrisome desire for fantasy saviors, as if mere mortals can no longer save themselves with their pitiful real-world powers. Psychoanalyzing the zeitgeist of films has long been a popular parlor game: much has been written about the popularity of monster films (often featuring nuclear radiation as the trigger of the mayhem) in 1950s Japan, and the meaning of the American Noir films in the 1950s. Correspondent C.D. recently submitted an interpretation of Hollywood's superhero movies: is our collective fascination with superheroes reflecting a sense that we no longer have the power to save ourselves? "One of the things I've been thinking about lately is the idea of TPTB (the Powers That Be) using entertainment, specifically movies, to keep the masses from rising up. Have you noticed how many modern movies use the archetype of the hero, but place that hero in opposition to some type of system (e.g. the Empire in Star Wars), or we have superheros. In both instances, there is a type of cathartic release for the audience's frustrations with the current system. When the evil empire is defeated in the movie, people get an emotional release and they feel less motivated to deal with the real world empire. When a superhero takes care of the problem, the audience is lulled into the pattern of thinking that someone else will take care of things. Also, often these superhero movies present the average Joe/Jane and the authorities as incompetents who need saving, which reinforces a feeling of helplessness to take on big powers. I'm sure others have come up with this type of analysis and I may be repeating what they have said, but it's worth further consideration." Thank you, C.D. I don't think it's much of a stretch to say that many people sense their power within the system is extremely limited, as is their power to radically transform their own situation. As for cheering for the ragtag rebels resisting the Empire--how many people feel divested from America, that is, they sense their "ownership" in the Empire's wealth and power is near-zero? How many feel disempowered and disenfranchised? It's not much of a leap from social, political and financial divestiture to feeling that it takes superpowers to change one's circumstances or save the system from disorder and destruction. Are we incapable of saving ourselves from a self-destructive status quo owned and operated by the few at the expense of the many? If we felt empowered in daily life, would we be so enamored of superheroes constantly saving our world from destruction? If we felt the system still had the wherewithal to restore itself, would we need so many superheroes? Or maybe it's all just good clean (highly profitable) fun, or a sci-fi/fantasy updating of Greek Mythology. Still, that practically every other movie is another installment of the superhero franchise seems to beg for a look beneath the surface appeal of these escapist extravaganzas. Thank you, Sally T. ($5/month), for your superlatively generous pledge to this site-- I am greatly honored by your support and readership.